To provide a natural gas reserve, Premium Engineering offers a system containing a natural gas liquefier, liquefied natural gas (LNG) tank farm, and LNG gasification system.To produce cold in the gas liquefier, a turboexpander is used. The gas liquefier is reliable in operation; it has a simple technological structure and a handy control system. Premium Engineering in alliance with Mafi-Trench Company LLC offers maintenance and upgrading services (up to full replacement) for hydrocarbon turboexpanders.Premium Engineering and Mafi-Trench have proven experience in maintenance and upgrading. We have a professional team and all the expertise necessary to satisfy the needs of our customers with regard to the maintenance and upgrading of Mafi-Trench turboexpanders, as well as turboexpanders manufactured by any other company. 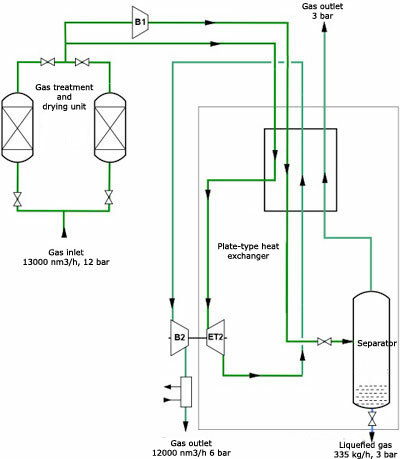 The highest efficiency of the turboexpander is a key goal for a modern gas processing plant. High efficiency, long periods between scheduled maintenance sessions, and trouble-free operation are the three vital goals we strive to attain. Low performance in any of the above is a good reason for upgrading. Low efficiency in a unit is often caused when the operating regime for which the unit was designed has altered. If the unit has been operating for a long time, the composition of the gas coming into the expander can vary. A re-calculation of the hydraulic end and its upgrading will enhance the unit's efficiency. Premium Engineering and Mafi-Trench are ready to calculate the current operating regime for your turboexpander free of charge. We will then advise you as to what mechanical and hydrodynamic improvements can be made.